The Temple Mount authority demand to be included in the “final solution” to the Jerusalem problem. Islam and the Vatican tries to evict the Zionist control of Jerusalem, to be replaced by a special regime. 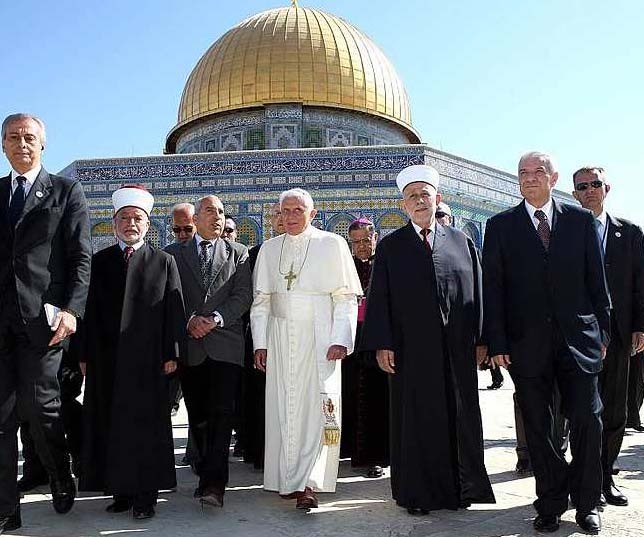 Minister of Awqaf and Islamic Affairs Abdul Salam Abbadi on Wednesday refuted claims that Israel has granted the Pope an “official seat” at a Muslim shrine believed to be the venue of Jesus’ Last Supper. In a statement, Abbadi cited a phone conversation between the director of Awqaf Department in Jerusalem and the Vatican’s representative in the Holy City, during which the envoy categorically denied that such a deal took place. Israeli media reported that the “historic agreement” between Israel and the Vatican was endorsed on January 29. It also include tax exemptions for Catholic institutions in Jerusalem. The Last Supper Hall is located in the upper floor of Prophet Daoud (David) Mosque, a key Muslim shrine in Jerusalem. According to the statement, the envoy told the awqaf official, Azzam Khatib, that the issue would be discussed with the government of Jordan, which has jurisdiction over Islamic sites, under a 1994 peace treaty with Israel. Abbadi said Prophet Daoud Mosque and shrine, with all their facilities constitute an Islamic waqf (endowment), adding that historic and religious documents attest to this and that the Jordan-run Islamic awqaf is the only party that is entitled to oversee the place. The minister denounced “[Israeli] attempts to change the status quo of the Holy City of Jerusalem”. This includes an Israeli decision to bar Muslims from their right to pray at the said mosque and another that denies the Dajanis, a Jerusalemite family that have historically been the custodians of Prophet Daoud Mosque, access to their old family cemetery, the minister said. The Israeli occupation has committed several crimes and violations in changing inscriptions, texts and verses of the Holy Koran inscribed on the walls of the mosque and plucking out the mosque tiles, said the statement, reiterating the ministry’s total rejection of any acts of aggression or any deals that would affect holy Islamic sites. It is interesting to see how Islam has falsified Word history. This ideology came into existence 600 years after Jesus walked the Earth, and 1.500 years after King David founded the city of Jerusalem. Still Muslim scholars use the Koran as a witness to King David building a Mosque. What a fraud. Only people who are completely ignorant of World history can believe such lies. The call to build Jerusalem is found in the Jewish Torah. And no where else. The legal right to this city if found in the Jewish Bible, and no where else. Before 315 A.D, there was no Pope. Rome’s historical claims to this city is passed on the Pagan Empires brutal occupation and colonialism of this land. Rome occupied Jerusalem when Jesus the Messiah walked on Earth, and did not lift a finger to end the occupation. Still the Pope use the name of Jesus to claim the control of this city. In our days, the Papacy tries to re-claim Jerusalem, in particular the Old city. With the help of Muslim, the Zionist control shall be replaced by a “special regime”. Even if the Muslims claim there is no deal between the Holy See and the cabinet in Israel, this deal is soon going to be sealed. First than the last and final antichrist will appear, and enter the Old City. On the very Temple Mount, the final antichrist will be hailed as “the prince of peace”. lmfao!! Dude go back to college and get a real job this post is laughable. Who are you to judge what anyone believes in? Your just a little piss pot that hides behind these posts. If you want real peace so TOLERANCE not bigatry. Delete this article because its a joke…. @ Markus- Dude go back to college and learn to spell- sow, not so. bigotry, not bigatry. You’re, not your.It’s, not its. I bet you don’t even have a job and if you do it’s definitely not as a writer. Face reality; past, present, future & the end. the Vatican has murdered more jews and Christians than anyone on the planet. They are the ones that put the yellow badges on the jews and worked with hitler to be sure the extermination was accomplished and than the Vatican worked with the u.s. government to express the Nazi’s out of Germany. This post is a lie and a total joke.